Winter Harbor is a small picturesque harbor that helped to shelter mariners from approaching storms. Winter Harbor Lighthouse was established and lit on January 1, 1857 to help guide the increasing traffic coming into Winter Harbor, and to guide mariners from nearby ledges in this often-foggy area. The last keeper of Winter Harbor Lighthouse was Captain Lester “Cap” Leighton. His grandson, Chan was a year old and was visiting his grandparents at the lighthouse. When his mother stepped out of the station’s boat at the island, she slipped, and “dunked” them both in the water. No one was hurt, and the keeper would comment that he felt his grandson was officially christened from the incident. 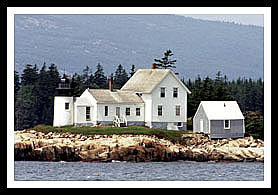 At one time Maine author Bernice Richmond lived here, and later wrote her classic Our Island Lighthouse and another entitled Winter Harbor from her experiences at the lighthouse. Others who purchased the lighthouse station over the years were authors as well. The lighthouse can be viewed from the park loop road from Mount Desert Island onto Acadia National Park’s Schoodic Peninsula. After viewing the lighthouse from water's edge continue towards the point and you'll find a dirt road on your left that will lead you up 440 feet high to Schoodic Head which overlooks Frenchman Bay on one side and Dyer Bay on the other. The views are absolutely breathtaking where you can see for many miles and it is so quiet you can here the continuous roar of the surf. 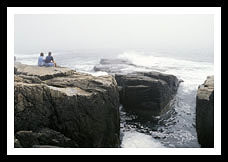 Here as you continue south on the park’s one-way loop road and take the road to Schoodic Point, you’ll find an incredible display of ocean surf smashing against a 400-foot headland of rocks. This is one of my favorite spots! There are also places along this road heading back if you look carefully where you can take trails to hike along the shore. Look for a Blueberry Hill sign along the way. You’ll find an intersection where you can pull over when the road rises and find this trail. When you reach the top of the hill you’ll find an awe-inspiring view of the bay, its islands, and a distant view of Petit Manan Lighthouse; bring your binoculars. Tour boats out of Bar Harbor will sometimes bring you into this harbor as well. For those who want to arrive at either Schoodic Harbor or Winter Harbor from Bar Harbor, and head back to Bay Harbor, the Bar Harbor Ferry, which is prart of Downeast Windjammer Cruise Lines, is happy to oblige. You can also take the Island Explorer bus free from the ferry pier to Schoodic Point, Winter Harbor, Birch Harbor, and Prospect Harbor. Winter Harbor is a classic down east fishing village that is still thriving today for lobstermen and scallop draggers. Part of this is due its location, where the harbor rarely freezes over in the winter months. From US Route 1 in West Goldsboro head south on Route 186 through Winter Harbor. Some of the better viewing spots are from the off road lookouts you’ll find about a mile south of the park entrance nearby. Provides ferry service between Bar Harbor and Winter Harbor. They also provide Windjammer Sailing aboard the Mary Todd or the Bailey Louise Todd schooners, or classic sailing on the Chrissy Lobster Sloop. Also provides ferry service between Southwest Harbor/Manset and the Cranberry Isles. Has special lighthouse cruises for visitors to have a unique aerial view of 6 beacons in the Acadia region, along with the landscape of Mount Desert Island of Acadia. 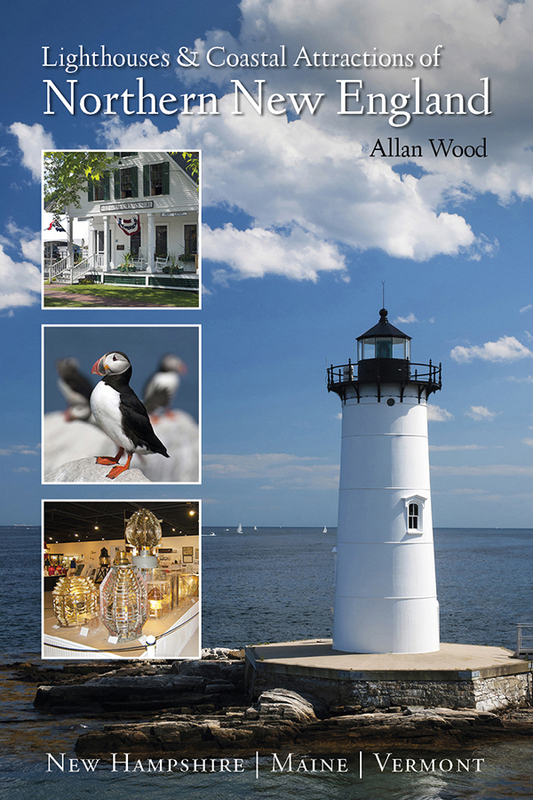 My 300-page book (with over 360 images), Lighthouses and Coastal Attractions of Northern New England: New Hampshire, Maine, and Vermont, provides human interest stories from each of the 76 lighthouses along the northeastern coastline, with plenty of coastal attractions and tours near each beacon, and contact info to plan your special vacation.